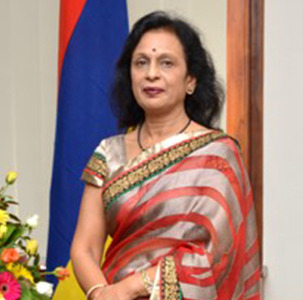 Her Excellency Santi Bai Hanoomanjee is the Speaker of the National Assembly of Mauritius, the first woman in the nation’s history to hold the post. She became the recipient of the country’s top honour when she was elevated to the rank of the Grand Commander of the Star and Key (GCSK) in 2015, in recognition of her contributions to public service, political and social fields. A graduate from the University of Mauritius, Mrs. Hanoomanjee’s career in civil service spanned over three decades. She attained the highest position of ‘Permanent Secretary’ before she retired in May 2005. During her tenure, she held several key positions in the country’s administrative machinery. She became the first appointed chairperson of the Mauritius Revenue Authority in 2004. She has also occupied leading positions in vital organisations such as the Mauritius Sugar Authority, the Sugar Planter’s Mechanical Pool Corporation, the Farmers Service Commission, and the Tea Board. Mrs. Hanoomanjee subsequently began a career in politics when she was elected in the largest constituency of the island in 2005. She served as member of the opposition from 2005 to 2010. After the general elections of 2010, she served as the Minister of Health and Quality of Life up to 2011. In December 2014, she was elected as the first woman Speaker of the National Assembly. On the international stage, Mrs. Hanoomanjee has represented Mauritius on several occasions, which includes discussions at ACP-EU level regarding the Sugar Protocol issues, lobbying missions to the EU in connection with Sugar Protocol, and in negotiations on trade issues with the World Trade Organisation.